These bright sweet muffins have a snappy crunch when you bite into them. The orange juice and zest pairs nicely with poppy seeds and makes a sweet addition to a morning tea break, knitting club, or after school snack. Poppy seeds are not something I typically keep in my kitchen. I got out of the habit of eating them when I was in the military and subject to random drug testing. No desire for false positives--no muffin is worth that. How did I get from muffins to drug testing in a single paragraph? Back to poppy seeds, because it is #MuffinMonday and I've got poppy seeds on my brain. Here's the thing (also the title of my current favorite podcast to listen to while working out in the basement)--I know oranges + poppy seeds rock the Salmon in the Company of Good Oranges. 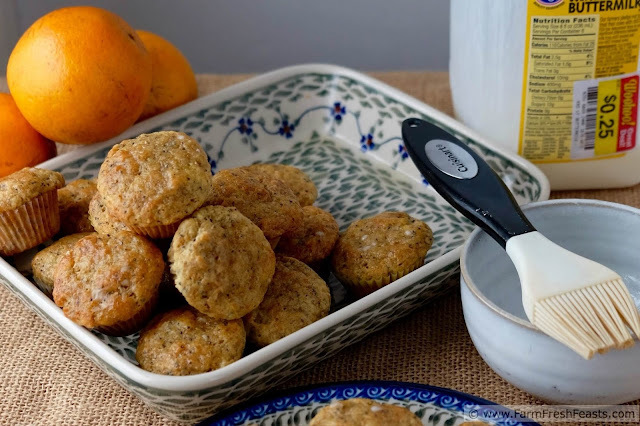 It stood to reason (in my mind) that, having a crisper drawer full of juice oranges and a container of poppy seeds left from an annual bowlful of pasta, I could swap the citrus in a poppy seed muffin. 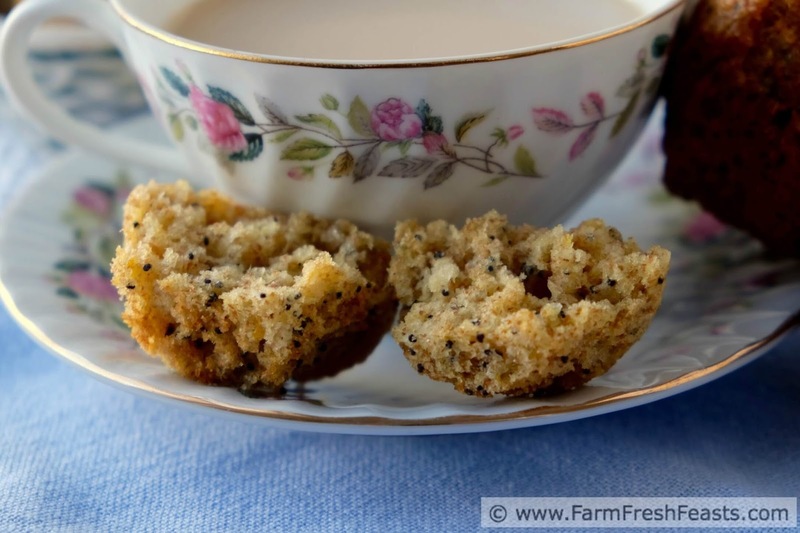 I looked around online for Lemon Poppyseed Muffins Using Buttermilk. (I'm working on a soaked oat and buttermilk bread recipe and had plenty on hand. When it's 25 cents for a half gallon you tend not to hoard.) I didn't see anything that appealed, so I consulted my trusty red checkered Better Homes and Gardens New Cook Book. I found a poppy seed muffin recipe that I used as a guideline for these tasty gems. 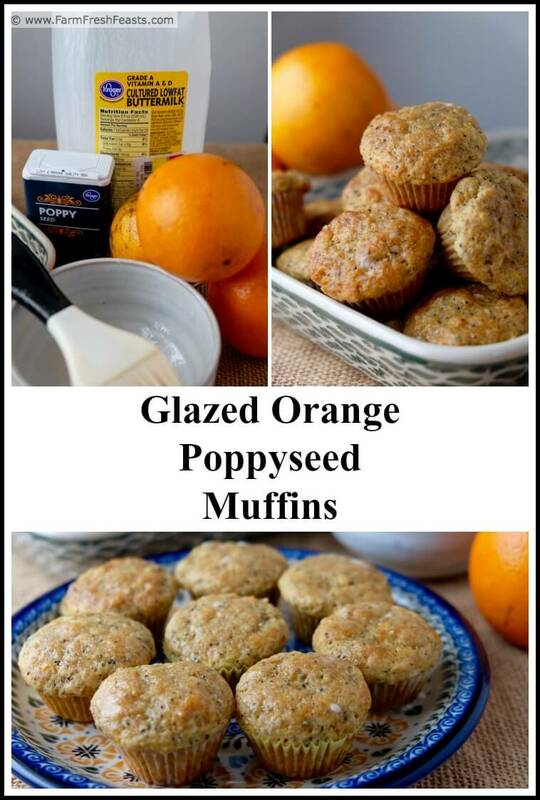 For more recipes using oranges, from a Marching Band Fruit Fundraiser or just because they are in season and on sale, please see my Orange Recipes Collection. It's part of the Visual Recipe Index by Ingredient, a resource for folks like me who have an alarming tendency to go big when it comes to seasonal produce. I'm sharing seasonal recipes on my FB page, pinning them to my Pinterest boards, and even giving you a taste of what's coming up on my Instagram feed. Want to know How to Use This Blog? Warning: making these muffins mini size is dangerous. You find yourself indiscriminately popping them into your mouth because they are so little and cute. Another Warning: more cute muffins ahead. 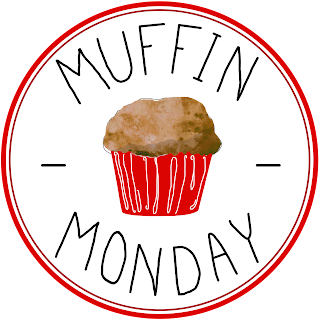 #MuffinMonday is a group of muffin loving bakers who get together once a month to bake muffins to brighten their Mondays. You can see all our of lovely muffins by following our Pinterest board. Preheat oven to 400 degrees Fahrenheit. Line a mini muffin pan with paper liners (much easier clean up, these don't have that much fat). Zest an orange into a large bowl. Juice the orange, and set aside 2 Tablespoons of juice in a separate small bowl for the glaze. Add buttermilk to the juice until the cup is ¾ full (for a total of 6 ounces, so in my case I added 5 ounces of buttermilk to the 1 ounce of orange juice). Transfer liquid to the bowl with the orange zest. Add an egg, the vegetable oil, and vanilla to the bowl. Whisk thoroughly. Dump salt, baking soda, sugar, flours, baking powder and poppy seeds on top of the egg/buttermilk mixture. Stir until just combined. Scoop (Amazon affiliate link) into prepared pan. Bake mini muffins for 12 minutes until tops are golden brown. While muffins are baking, stir reserved orange juice and powdered sugar together until sugar is dissolved. Let baked muffins rest in pan for 5 minutes, then transfer to a cooling rack and brush with glaze. Serve warm or at room temperature. 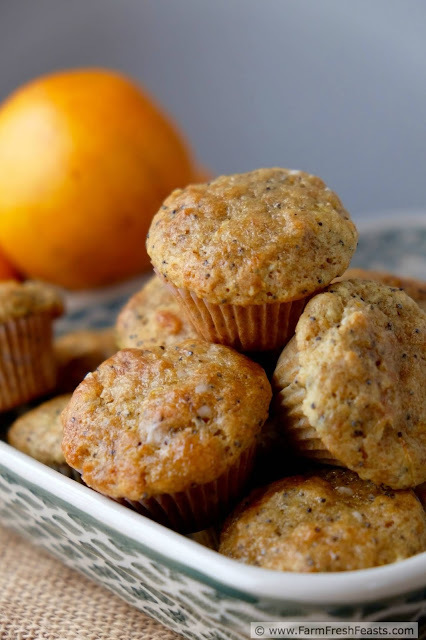 This recipe was adapted from the Poppyseed Muffin recipe in the Better Homes and Gardens: New Cook Book (Amazon affiliate link). 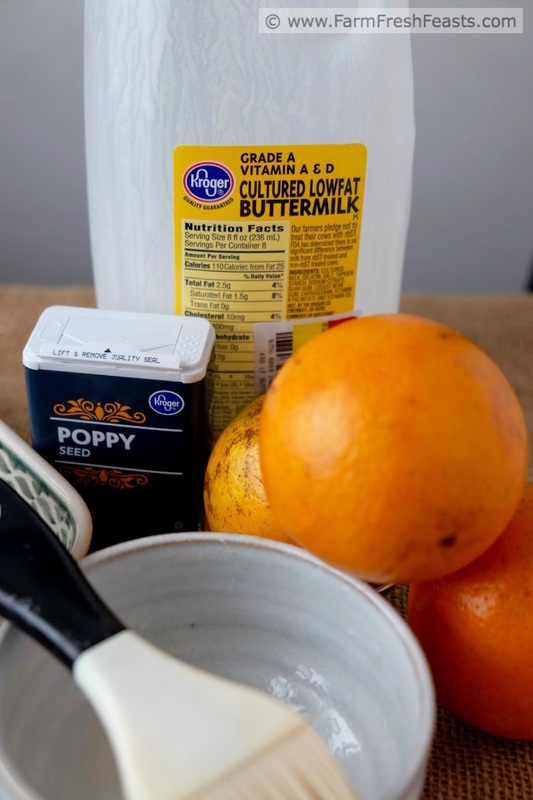 I changed the milk to buttermilk, swapped half the all purpose flour with whole wheat flour, decreased the sugar, and added an orange, vanilla extract, and baking soda to the original recipe. 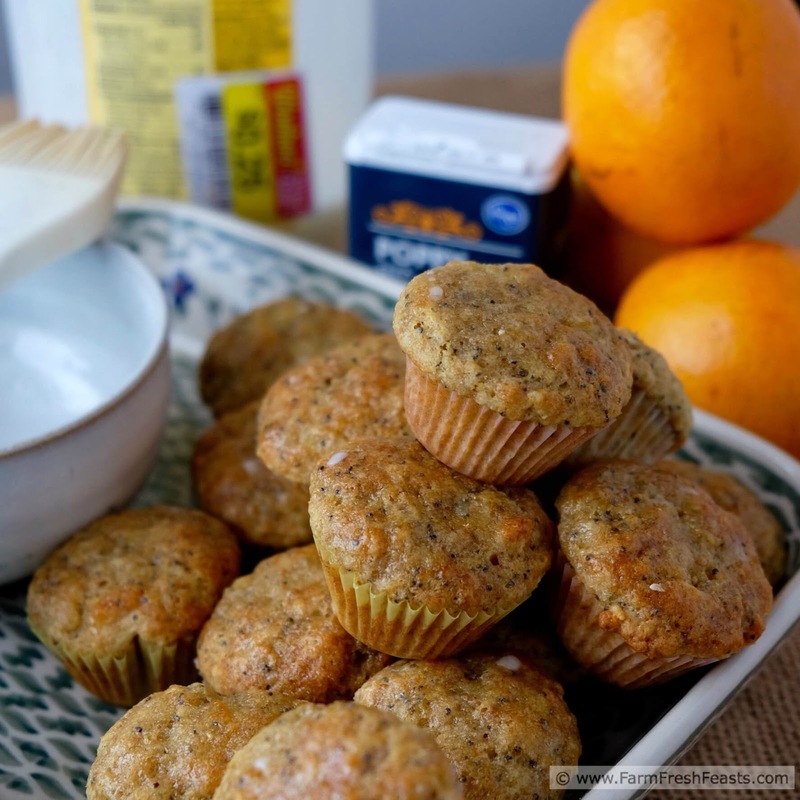 Citrus and poppyseeds are such a wonderful combination. I think these little muffins would disappear quickly around my house. I made these in the morning before heading into the shop--except the snowy weather ended up closing the place, so I was stuck at home with 2 dozen muffins! I saved out a few for the kid' for snack, and popped the rest in the freezer to take to my knitting group 2 days later. I can't handle temptation lying around, staring sweetly up at me. I completely get the thing about false positives on drug tests from eating poppy seeds. Where I live they think that is such a problem that one cannot even bring poppy seeds into the country! Yep, on the prohibited list. I got a kick out of the band selling oranges as a fundraiser. Whatever happened to overpriced chocolate bars and wrapping paper? Never mind, if I'm honest, I'd rather have oranges anyway. Especially if I could make some of your buttermilk muffins with the juice, Kirsten. Sweet choice! P.S. Thanks for the heads up on the podcast. Looks interesting! I am not surprised they are not allowed where you live. Makes eating them while you're traveling even more a treat, no? I'm so glad to have outgrown the wrapping paper fundraisers. Oy! It's harder to haul cases of citrus around, but then again the kids are older and can do it themselves. For the podcast--it's Alec Baldwin talking with really anyone. In his archives there's a lovely interview with Debbie Reynolds, and recently I listened to one where he talks with men who are preserving historic sites in Greenwich Village and historic ways of life in rural Maine. Very eclectic. Love the drug test reference. My mind would go there too. That second photo is just beautiful (not that the rest aren't, it's just that that one made me stop and stare). Great flavor combination! I'm glad I'm not alone in the wild mind swings. For my Everything Bagel Focaccia bread I even had my local Spice Lady mix up a poppyseed-free Everything Bagel topping so my spouse could enjoy without worrying. Great combination, and I wouldn't mind the minis if it meant I could pop more muffins into my mouth. You are welcome to pop more minis in your mouth--I'm more than happy to share. Let it not be said I'm withholding food from a pregnant woman. Haha, yes, I don't use poppy seeds that often for the same reason. (Hubby is military) But I do love them. And these muffins! Poppy seeds are now on the Things to Eat While Dad's Deployed list, along with shrimp, bagels, and popcorn/apples/cheese for dinner. If the machine will only be used occasionally, you may consider buying a hand operated squeezer. Orange Juice machine www.orangejuicer-review.com These are usually inexpensive and are ideal for making one or two cups now and then. You should however know that you will have to peel and slice the fruits by yourself.